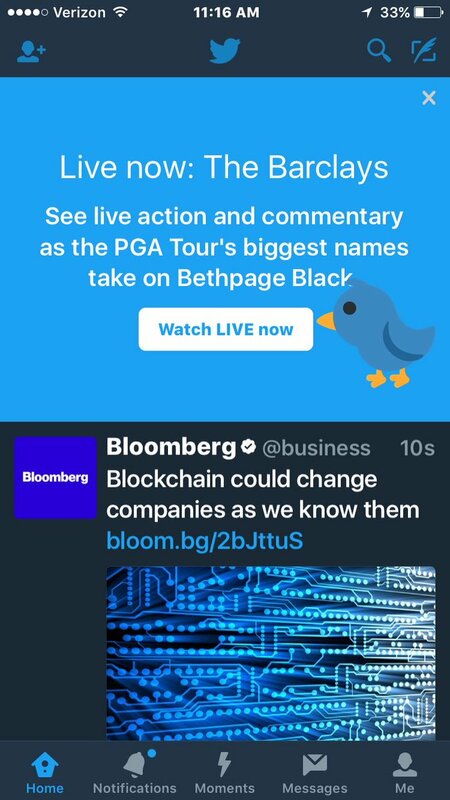 Twitter is developing a dedicated page on its service where you’ll be able to catch streamed coverage of live events. With its expected launch, it’ll be easier to watch videos from the NFL, PGA, NHL, NBA, MLS, and other content providers without needing to search endlessly for a link. There’s no public timing for when this page will be rolled out, but one could hazard a guess that it might be right when the NFL’s regular season kicks off this year. Earlier today, Twitter’s chief financial officer Anthony Noto confirmed the livestreaming effort in a tweet. As Twitter signs content partnerships with major sports leagues and other groups, the company has begun testing out its video capabilities to ensure that it can scale. The best way to do this is open it up to the service’s 313 million monthly active users, but in a way that doesn’t overload the system. That’s probably why users are seeing notifications within the Twitter app inviting them to watch things like the Republican and Democratic National Conventions, the PGA Tour’s Barclays golf tournament, Wimbledon, and other events. Should Twitter work out all the kinks of its platform, it’ll likely move into the next phase of more active promotion. After all, having a service that fails at a time when you absolutely need it to work won’t look good for the company. It’s possible that when a permanent place is set up on Twitter, the company will enable users to not only watch games and other events live on the site and apps, but also interact with fans and followers, share moments and GIFs with one another.